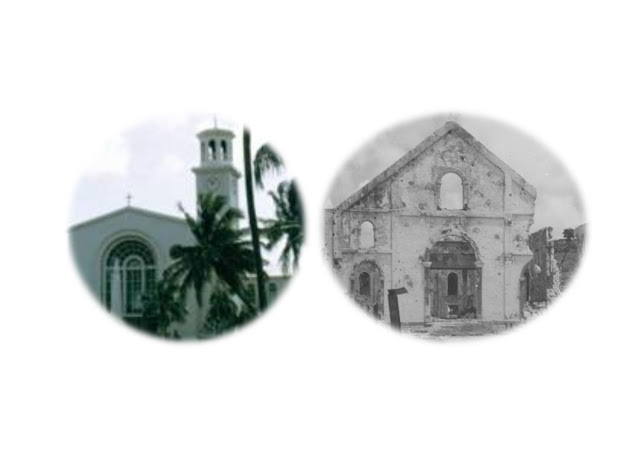 What picture above depicts the "spiritual" condition of the Archdiocese of Guam? The Church Militant, the faithful laity of Guam have been fighting for and defending the ONE, TRUE, APOSTOLIC Church for the last 3 years. There are those, who from the sidelines, see this as a battle of egos and words. Nothing could be further from the truth. With the recent passing of Bill 326-33 Apurun's victims will now have recourse to justice through civil courts and all HELL is breaking loose in the fight to save RMS. The "Puppet Master" Filoni has been exposed along with Kiko's Roach Motel Semenaries. 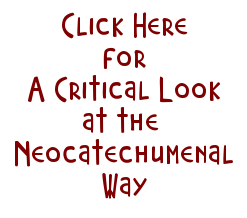 All the facts have been well documented and discussed from a variety of sources with different styles and acumen's. The Body of Christ, His Church, the faithful are "many parts and all one body". The WAR has just begun and is being fought in two dimensions. Put on the Armor of God. St. Michael the Archangel defend us in battle! Thank You Bruce for the pictures! The Church on the right is what our True Catholic Church really looks like today after apru-run and his NCW decided to take over for earthly and materialistic gains! The True Katolikus know that once we get rid of all this evilness that has invaded our Churches, It Will Be Once Again Like The Church on the Left! We Re-Built Once - We Can Do It Again! I sent a Facebook message to my battle buddy Dennis Santo Tomas two days ago asking if he had anything to do with the complaint that was filed by the Catholic Cemeteries of Guam, Inc. with the Guam Police Department and the Attorney General's Office. I even copied and pasted the synopsis of what Tim shared detailing the transparency of Monsignor James actions “indicated that the checks were for the 20th ordination anniversary celebration” and how it was paid in full plus interest in a matter of days. How does the $14,000 that was repaid with interest within days compare to the $70million dollar Archdiocese asset that was secretly given away to the NCW? 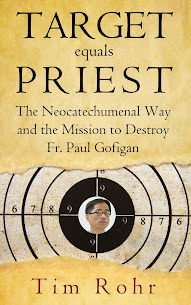 Monsignor James does not deserve this smear campaign the NCW has raised against him. Dennis normally responds in a timely manner. His silence in this matter is quite deafening almost to the point of unfriending him. However, before making any rash decisions, I must account the fact of having experience the stress of the battlefield together where we had each other’s six. I can only pray that he does the right thing. It's understandable why Santo Tomas maybe silent. The trained lawyer implicated the board in her letters. She's a lawyer who is suppose to do the right thing. Instead it's obvious she over stepped the mark, went against Hon and the churche's authority. She implicated the board who may or may not have known the intent with out the churche's authority. Therefore the silence of Dennis Santo Tomas is quite understandable as he and the others may need to time to discuss next steps. Seek outside professional advice about the trained lawyers actions. Or be waiting to meet with Hon for his actions. Hopefully the board is feeling embarrassed and not righteous as they would if Apurun was here. Recently, there was a picture of an open-air mass shortly after Liberation Day, 1944. That picture depicts the Church. The pictures you now show depicts physical structures which house, or used to house, the Church. As JDR said, "We rebuilt once - we can do it again!" But, first we have to get rid of the invaders!! Once again the Neos have openly defied Hon by filing a complaint with GPD/AG and demonstrating their complete idiocy and arrogance. In raising Hon's ire, they now are subject to "serious consequences"
Is there a battle in the offing between Hon and his boss, Filoni? Filoni is pro-neo and Hon, at times (remember his double speak) seems to be on our side. Neos around the world! You've heard of "People Power"? Now the world will be hearing of "Catholic People Power." Biba Katoliku. Biba!! Yes. "Guam Catholic People Power."